Legends Of Tomorrow Hawkman and Hawkgirl Revealed! So the hits keep on coming as we roll towards the new seasons of Arrow and The Flash, plus the debut of Legends of Tomorrow (and, I suppose, Vixen as well). 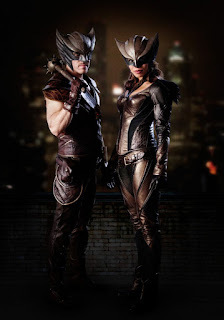 And from Deadline (care of Newsarama) comes this promotional picture showing us the full uniforms (sans wings) for Hawkman and Hawkgirl. --Firstly, obviously no wings. I am going to assume that the wings will be retractable or removable on the show so that they can move around sets without bumping into things. Whether they will be practical or CGI is a debate I have seen; I am leaning towards a mix, similar to what was done on Smallville. --The color scheme seems so... drab. Couldn't they have thrown a little green in there? Of course, given that Ollie is wearing more green, Barry wears red, and so forth, maybe going with a brown palette is a way to break things up visually across the DCTVU. If you wanted to get a darker color scheme for the Winged Wonders, I suppose you could have gone with Hawkworld style grey and gold, but that might be a bit too severe. I do like the hints of straps and Hawk emblem on Carter; Kendra looks to be wearing a medallion of some sort, and her bodice suggests straps across her chest and sternum as well, sort of like the post-Blackest Night Shiera. --The helmets look well put together. I like that they are a little bit ornate but overwrought. I also like keeping the basic shape of Kendra's swoopy, Silver Age style helmet rather than putting them in similar styles. --Where's Kendra's weapon? I am going to assume that she will be wielding her typical arsenal in the series, but would it have been too hard to give her a spear or flail here? Looking closely, you can just kinda-sorta make out what might be a cestus on her glove, but it looks too far back on the hand to really convince me. As far as Carter, the morningstar is most welcome. Given the amount of arrow-piercings that CW can get away with, I am hoping to have some good "smash ups" in his fights. More intriguing though -- check out the holster on his hip! Maybe I am reaching a bit here but is it too much to ask that we get the debut of the Graviton Pistol?! --Interesting enough, Carter appears less covered than Kendra. She has a bit of a neckline, but certainly not plunging (pun intended) into Power Girl territory. But Carter also has a neckline, as well as his beefy biceps on display for all to see. I do like Kendra's belt as well -- a little bit Julie Newmar, a little bit Han Solo. --Falk Hentschel has his Hawk-frown down. Ciara Renee does make me think of Kendra here, specifically from Volume 4 when she tended to be more interested in helping people than hurting bad guys. Still eager to see her in full "Hawkgirl Smash" mode. Overall, as a promo picture, it does its job of getting me -- as a Hawkfan -- very excited! I was not expecting bright green and yellow, so even though the brown is still a bit odd, I can appreciate what the production seems to be shooting for. I remaing very excited for this show and can hardly wait to see the Hawks in action. What do you think of the new promo shot? Does it get you more hyped up for Legends, or is this some cold water? Image: Hawkman and Hawkgirl Legends of Tomorrow Promotional Picture, 2015, Newsarama.